This quarterly publication produced by the University of California's Agriculture and Natural Resources division contains peer-reviewed research and news in agricultural, natural and human resources. Articles cover a variety of topics ranging from conservation to biofuels to nutrition education -- and much more. California Firewood Task Force's message: “Buy it where you burn it”. October-December 2011. California agritourism operations and their economic potential are growing. April-June 2011. Research connects soil hydrology and stream water chemistry in California oak woodlands. April-June 2010. Often entire issues cover specific themes including Food Choices and Health, Climate Change, and Sudden Oak Death. 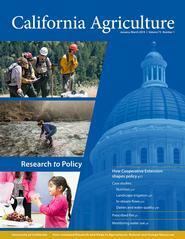 Explore current and archived issues of California Agriculture.